LATHER, purveyors of beautiful bath, body and complexion products has put together a three piece collection that will delight anyone who loves fine beauty products and packaged it in a box that is so pretty that you can skip the wrapping paper, pop on a bow and place it under the tree or into someone's waiting hands. Slip the decorated outer sleeve and inside are three full sized body care products all infused with the gorgeous scent of exotic white blooms jasmine, plumeria and ylang ylang that combine to delight my senses as they pamper my skin. 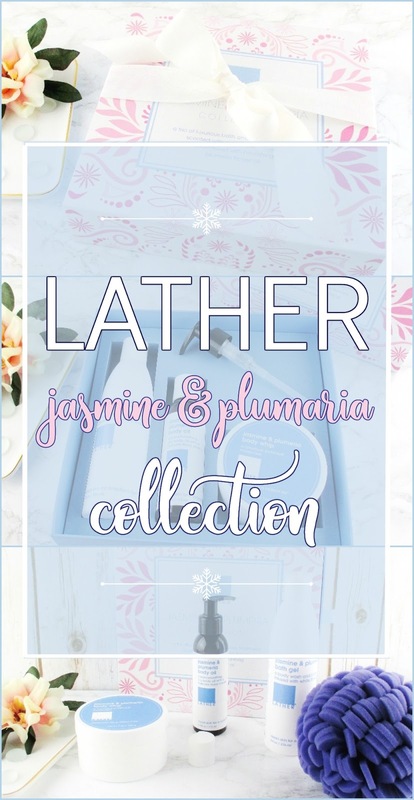 LATHER Jasmine & Plumeria Collection, $58.00 (a $74.00 value) includes a bath gel, a body oil and a huge tub of their fabulous body whip. Can I tempt you with these lovely goodies? Jasmine & Plumeria Bath Gel, $18.00 is the perfect way to wake up in the morning or soothe my senses after a long, busy day. This bath gel also makes a lovely body wash in the shower that offers a nice suds and rinses away clean, leaving my skin feeling fresh, lightly hydrated and smelling good. I like to apply Jasmine & Plumeria Body Oil, $28.00 right after I step out of the shower to my wet skin. A little bit of this beautifully scented, lightweight oil goes a long way and after I gently pat my skin dry, it feels like velvet, all over and not at all oily. The final step is the Jasmine & Plumeria Body Whip, $28.00. This of one of my all time favorite LATHER products. The Body Whip is so richly hydrating and softening but it's nearly as light as air. This gorgeous body cream spreads easily across my skin to drop right into my skin and leaves it soft and smooth without a trace of a greasy or sticky after feel. Just look at that cloud of rich, indulgently scented body whip. Yes, it's as gorgeous to use as it looks! Ultimate Spa, $129.00 (a $174.00 value) is packed with a variety of LATHER'S best. And the value is incredible. Sugar Plum Kisses, $15.00. This two step pout perfecter includes a gentle cane sugar scrub and a hydrating balm for pillowy soft lips. I had this set last year and I loved it! Have you tried LATHER'S candles and soaps? If you haven't, you're really in for a treat! Their two piece soap and candle sets, at only $18.00 each in Mint, Vanilla, Lavender and Lemongrass make perfect stocking stuffers, Secret Santa Gifts or a thoughtful remembrance for teachers. The soaps are formulated with saponified palm, coconut and olive oils. enhanced with real oats, flower buds and seeds and scented with natural fragrances. The soy wax candles offer a clean and healthy burn and have very nice scent throw. And the little tins are reusable, after they've been cleaned out. I have a couple floating around with little bits and pieces stored in them. LATHER products are cruelty free, they use no sulfates, parabens, synthetic colours or fragrances. I hope that I was able to help you get a little of your shopping done. There is still time to get your goodies shipped to you or you can pop into any of the LATHER locations in Pasadena, Scottsdale, Atlanta, Fairfax or Honolulu to pick up all of the things you need to pamper that special someone. If you enjoyed this post, would you please help me out and give it a share? Thank you. The whole collection sounds and looks really nice. I love Plumeria, so this set would definitely be one I would like! Looks perfect as a gift too! Girl, this scent is so gorgeous. This sounds absolutely DIVINE! You had m at Jasmine! That was the first word that grabbed me, too. Although those are not scents that work for me, I know that so many women love them. 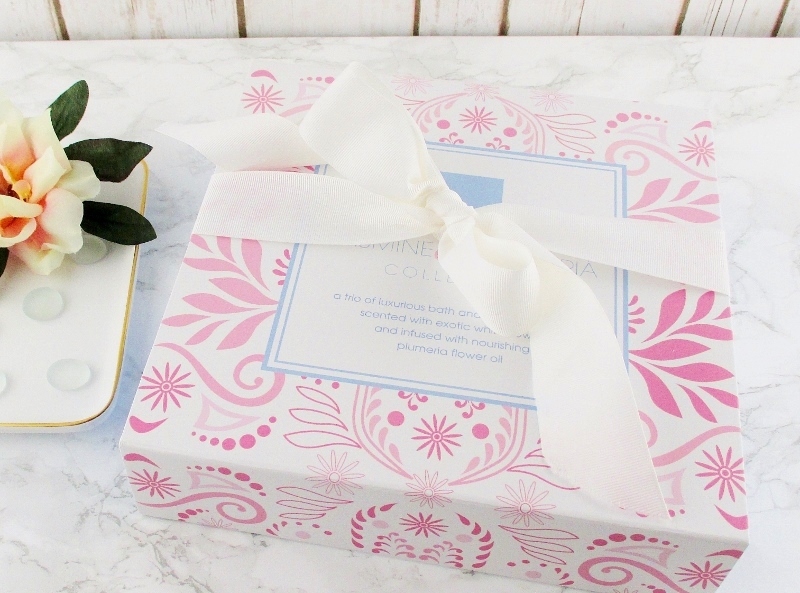 What a stunningly beautiful gift collection that is! 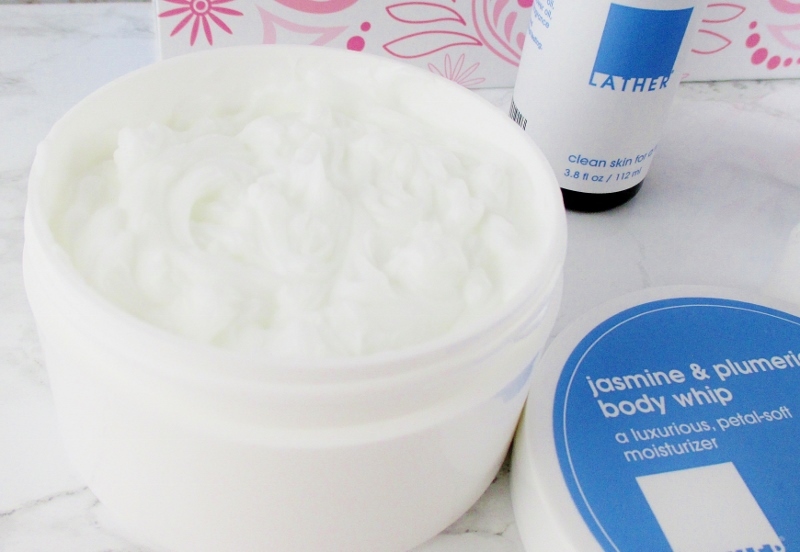 The fluffiness of the body butter is amazing - I need it in a different scent, and I know LATHER will have it! They have lavender, bamboo and lemongrass... You should find a scent that you like. I bet this set smells wonderful. I really wish we could get a smell-o-vision or something for reviews like these. So do I! That would make them so much more fun and easier to see if you like the scent, too! I hate plumeria, but I LOVE jasmine. I'm so torn. I get more jasmine than plumeria but, if you don't like plumeria, you might pick it out, more. Their lavender and lemongrass are heavenly, too. 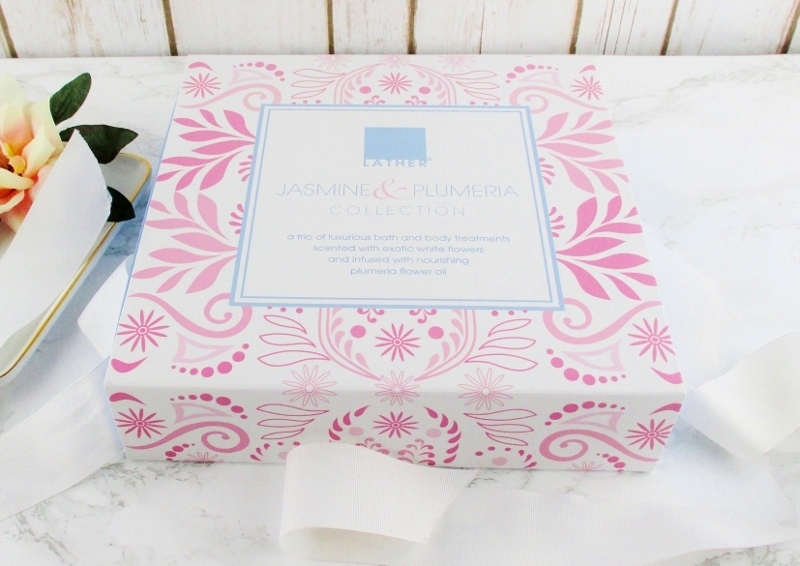 I'm really not a fan of jasmine and not too fond of plumeria either, but this sounds like a great gift idea for those that do! They have other scents. Their vanilla lemongrass and lavender are gorgeous, too. I would love to have jasmine growing by my door or windows. I’d have to sniff this first, not sure if the scent, but oh my word I need some of that body whip in my life. This set is full of win. The body whip is the best. It's so hydrating but it never leaves my skin feeling sticky or greasy. They do the nicest gift sets. Even though I couldn't do this fragrance I could do Mint! I don't think I've ever tried a Lather product I didn't love. This brand is so good! Ever since I first went to Hawaii, I've loved the scent of Plumeria. I'm putting this set on my wishlist! It's gorgeous, you'll love it. I'm so excited to dive into this! That's how I feel about anything Lather. Love the concept and presentation! Would love to find something like this in Lavender! I'm a huge lavender fan so anytime I see that, I gravitate. I'll have to put this on my wish list! I swear body oils are where it's at when it comes to winter skincare. That looks like a lovely set! That sounds like the perfect set for gifting. Yes, you definitely CAN tempt me. The box makes a beautiful presentation and just imagining the scent is like Heaven! I don't think I've ever tried anything from this line, but the scent sounds so relaxing! I love the presentation of the box too, so cute! That body whip! 🙀🙀🙀 I want that cloud on my body! I really want to try Lather, I always hear such good things about them! I love plumeria, too, this would be a winner for me. I love little gift sets like this - so luxurious. The body whip looks AMAZING!